A square patchwork cushion is made up of right angled triangles along the edges and squares in the middle. The first cushion made consists of only four triangles, the second is made up of eight triangles and four squares. Students are required to explore this pattern to find connections between the size of the cushion, the number of triangles required and the number of squares required. To solve the problem, students are required to record their findings accurately, vary the size of the cushion systematically, make generalisations and communicate their findings effectively. 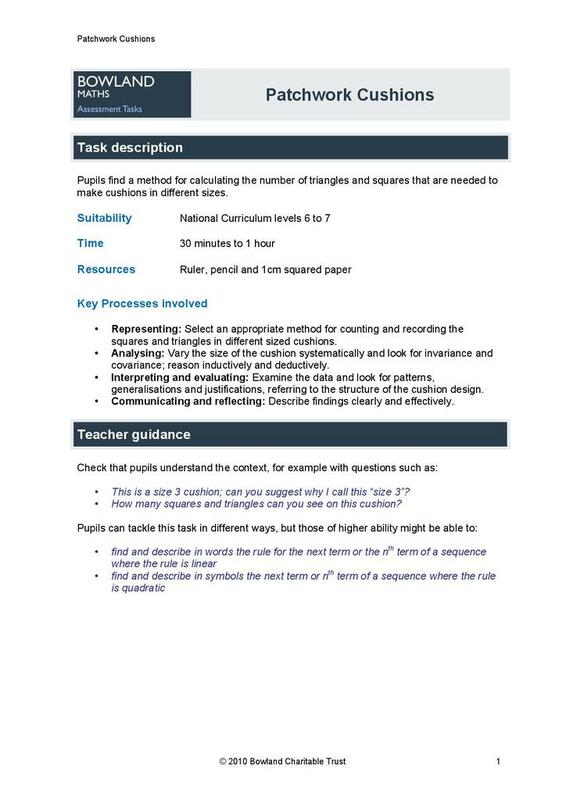 Teacher guidance includes concepts which may be discussed with students, examples of probing questions which may be useful and assumptions that students need to make when completing the task. The assessment guidance consists of a progression table detailing how students may improve in each of the key processes. The resource concludes with a number of examples of students' work, together with comments, probing questions and feedback. This resource was produced by the Bowland Charitable Trust.